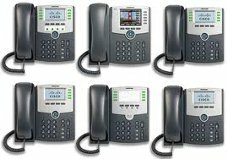 Cisco SPA500 Series IP Phones are designed to improve and simplify communications across your entire company. These phones offer enough features for everyone, from executives and cubicle workers to administrative staff in your organization. Building Block Computers provides both New and Pre-Owned Cisco SPA Phones. All makes and models are available and all equipment comes fully tested and backed with a 90-Day Warranty.